Hi Friends. I am SO excited to share this recipe and video with you I can hardly stand it!! I have this addiction to copycat recipes. There is something so fun and challenging about seeing if I can make a recipe better than popular restaurants. It’s like I live in my own real-life version of Chopped or something. The only difference is there is no money on the line, I have no live audience watching, and probably no one really cares in the end. However, if you were to see me eating this recipe Saturday, you would have thought I won the lottery. I could hardly contain my excitement at how great this recipe turned out. I called my entire family over (who eagerly came) and we ate Cup Bop Korean BBQ all night. It was lovely! 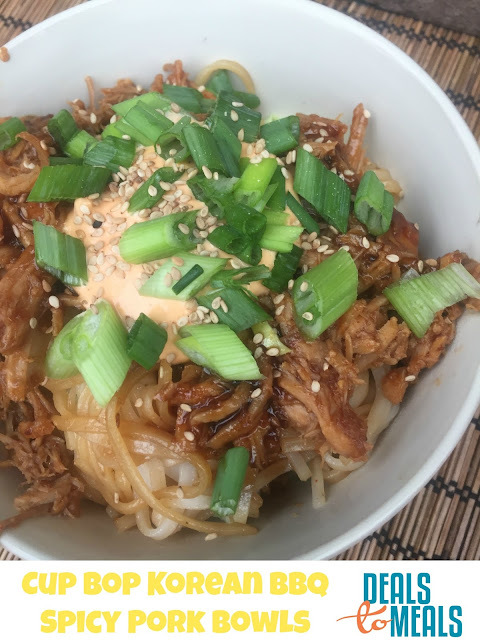 The best part about this recipe is for the entire recipe (fed 15+ servings) it only cost $15 to make (assuming you have most of the Asian ingredients already). That’s only $1 a person instead of $10 a person. Cooking from home is always so much cheaper, and better in my humble opinion. 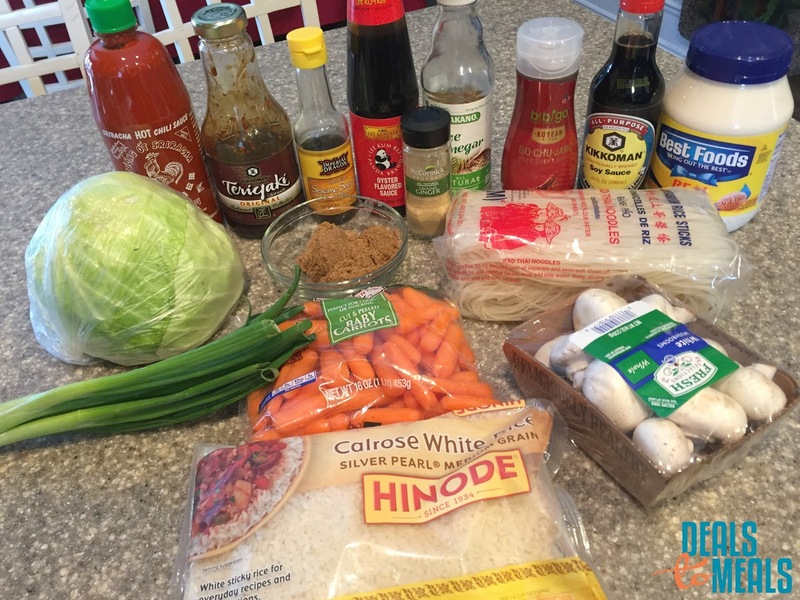 Login to Deals to Meals to see where you can get pork, brown sugar, green onions, cabbage, carrots, onions and many of the other ingredients you need on sale in your areas. I can’t wait for you to try this! You can be the judge as to whether it’s great or not. 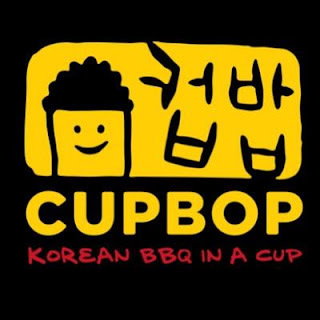 I want to hear your feedback, especially those of you who have had Cup Bop before. I really think you’re in for a treat! Not to mention this recipe is super easy to make (once you buy a couple key ingredients). Place the pork roast into a slow cooker. Season with salt and pepper. Turn the slow cooker to high heat and cook for 4-5 hours, or until the pork shreds easily. Once the pork is cooked, drain all of the juices from the pork and remove any excess fat. Pour half of the sauce mixture over the cooked pork and then shred the meat and let it soak in the sauce while you continue to make the other ingredients. Start the rice in a rice cooker and let cook. Bring a medium sized pot with water and bring to a boil. Once the water is boiling, add the rice noodles to the water and stir. 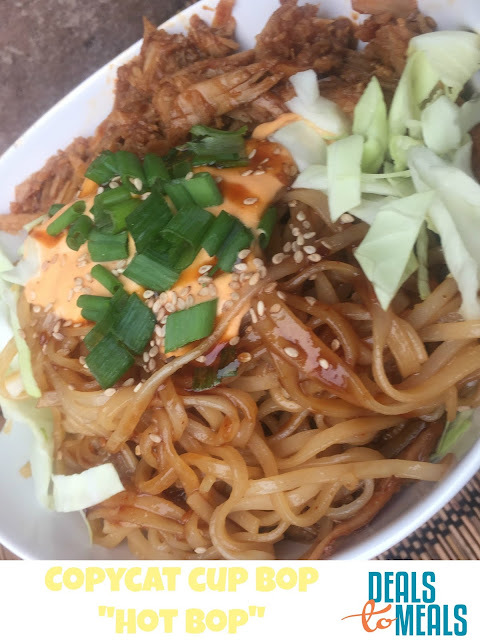 The noodles will cook in just 2-3 minutes, so continue to stir and then drain from the water once they are cooked and tender (don't cook until mushy, just tender). 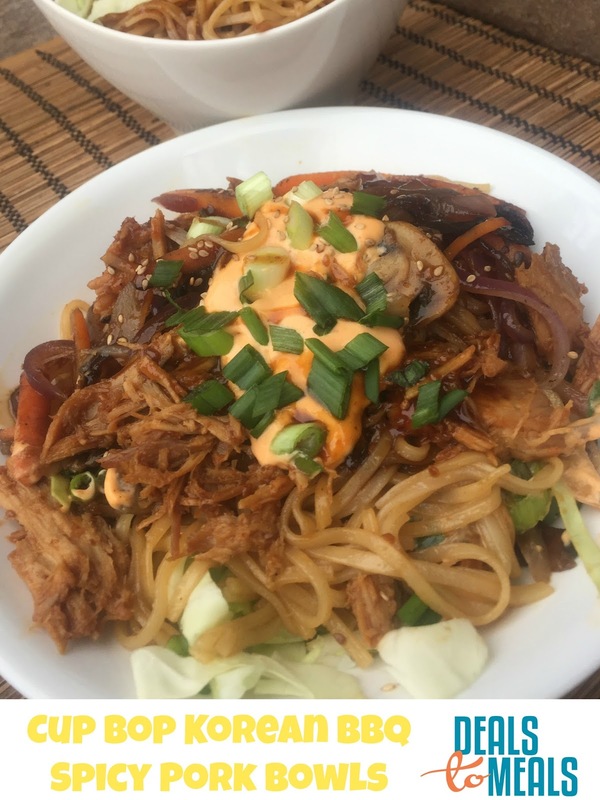 Put the noodles in a bowl and add enough sauce to the noodles to moisten and keep them from sticking to each other. You can also add a couple tablespoons of olive oil to the noodles to keep them from sticking if you aren't going to serve them right away. For the stirfry, cut all of the vegetables into thin slices (if you're using carrots, mushrooms, etc.). Set aside the cabbage (or lettuce) and green onions for garnish. Heat a suate pan to medium heat and add a few tablespoons of olive oil or sesame oil the pan. Add the vegetables (minus the cabbage) and saute until they are tender. To assemble the rice bowls, place a portion of cooked rice on the bottom of a bowl. Add some of the chopped cabbage (or lettuce) on top. Add a portion of the noodles and then the meat on top. Drizzle with extra sauce/marinade and a dollop of the Siracha Mayo. Garnish with sliced green onions and sesame seeds. Extra cooked meat can be frozen for a later meal if you wish.